The Thrift Savings Plan unveiled the new TSP Website yesterday in the hopes of improving users’ experience and navigation. Now, the site has everything in an easy to navigate layout. 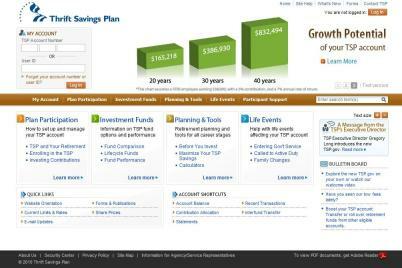 The Federal Retirement Thrift Investment Board, which oversees the TSP, announced the redesign in July 2009 and finally got the new site up and running a year later. The redesigned website includes easy to find information about who is eligible for the retirement plan, investment options, loans, savings and monthly payment calculators, and guidance for new life events like entering and leaving military service or steps to follow after an investor’s death. A lot of the changes that the site made were in response to users’ comments and suggestions, and even more changes may continue to evolve the site. The web portal is based around organized sections that allow easier and faster access to your account. Overall, the new changes are a great upgrade to the website and long overdue. Now, users will easily be able to navigate through their account and its many functions and receive answers to any questions that they may encounter about the plan and their retirement options.